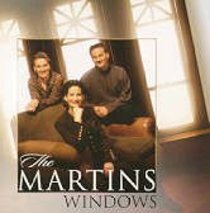 The Martins are one of the few artists in the Christian music industry that have successfully bridged multiple genres of music. Their previous recordings, including Dream Big, Light Of The World, and Wherever You Are, have been the stepping stones to expanding their audience to the full body of the church. Using an amazing blend of musical styles, Windows continues on that same journey to further expand their fan base. This is not just any music. Put quite simply, it's Martins music.